Wounded Times: Protectors and Defenders Deported? 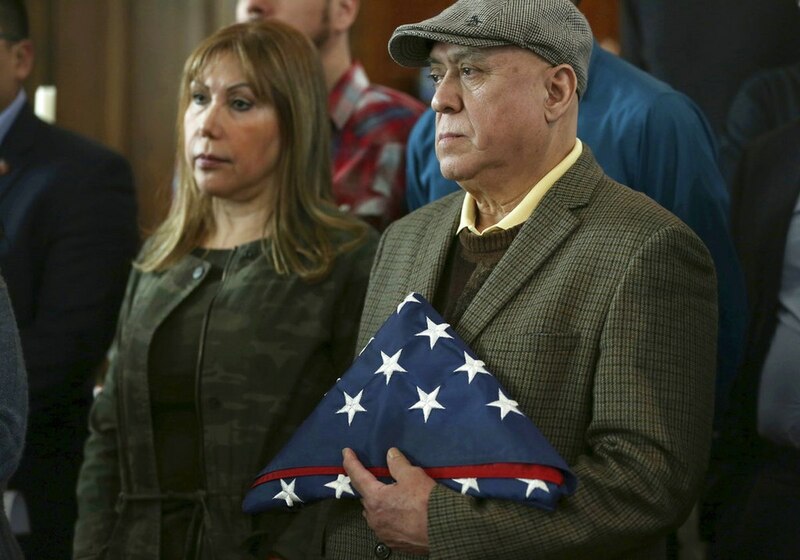 As many as 11,800 currently serving in the U.S. military are dealing with a spouse or family member who is facing deportation, a national immigration advocacy group announced Friday. Esperanza Perez and her husband, Miguel Perez, parents of war veteran Miguel Perez Jr., stand with a handful of military veterans during a news conference Feb. 27 at the Lincoln Methodist Church in Chicago. U.S. Immigration and Customs Enforcement officials confirmed March 26 that Miguel Perez had been deported to Mexico because of a 2008 drug-trafficking conviction. It’s also not a number that can be easily checked, or verified, because neither DoD, the Department of Homeland Security nor U.S. Immigration and Customs Enforcement tracks military status in immigration proceedings. American Families United, a non-profit immigration advocacy group, calculated the estimate using 2011 U.S. Census statistics, which found that 6.3 percent of the 129 million married Americans are married to foreign-born spouses. The Pew Research Center found that one in four of those foreign-born spouses are in the country illegally. About 75 percent of that population comes from countries like Mexico, where if they entered illegally, they have a harder time obtaining legal status, as opposed to a person from Europe who might have overstayed a visa, said American Families United President Randall Emery.